One voice, low and hard to hear over the sound of the booming fireworks, was an 8th grade boy singing gruffly this well-known and moving song. No one joined him, but he didn’t seem to care. He carried on until the end and took no note if anyone was paying attention. I’m not sure anyone else heard him but me. God invites us to sing, to sing his praises not minding if anyone joins in – but to persist and sing nonetheless. 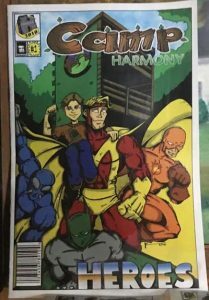 Camp Harmony Heroes. Photo by Laura Hay. One of the sessions that our worship leader, Nick, talked about was being a “weirdo” and the implications that word has. Where Nick would use “weirdo,” I would say “rebel.” Christianity is mainstream. Being a “one hour a week Christian” is mainstream. But what if we had the rebellious spirit of that boy raising his voice above the fireworks? What if our actions, and not our words, called others to us and through us allowed them to see good in the world? That’s what being Brethren is to me. One of the first days of camp there was a trash can that had been knocked over by a cat at the pavilion. One person began to pick up the trash. No one helping at first, but slowly more hands joined to help with the clean-up. That’s who Brethren are, that’s what we do. We live the life we feel is the best representation of Jesus and hope people see that and join in. Jesus was a “weirdo,” and he was rebellious. Be a “weirdo!” Be a rebel in the way Jesus was. Picking up that trash wasn’t the coolest thing to do. Getting all dirty and touching a bunch of disgusting garbage is gross. But it’s what this person felt was right. While I was in Pennsylvania at Camp Harmony, many people from our denomination came together at Annual Conference to work at what it means to be Brethren and how we do that on the national level. I wasn’t there, but I hope that the conference kept that value in mind: Brethren show our faith through action, boldly following the rebellious spirit of Jesus and continuing that work – peacefully, simply, and together!